My trusty Ibanez DML10 has been my staple for slightly modulated delay for ages now, but the pedal is a bit of a one-trick pony. It is a good trick, but still… And using the 11Rack rig with expression controllers has made me accustomed to being able to adjust several parameters at once, in unison. I love being able to adjust the echo level and have the feedback also increase, so you can go from a standard setting to a washed-out droning sound in one go. One day, I realized the Toneprint feature in the Flashback Mini will let you do just that. You can program what the knobs should do, including having each one control up to three parameters. So I bought one, quickly dialed up a tape echo sound and made the ”fx level” knob control both the echo level and the feedback. I then spent some time adjusting the curve of both parameters so that when I go from 10 o’clock to about 2 o’clock on the ”echo level” dial, the echo goes from normal to very washed-out drone – perfect! I then mapped the ”feedback” knob to control the modulation mix (mostly because I wanted it do do something), and adjusted the delay time range so it fell within the range I needed. So far, it works a treat! When I finished my true bypass loop strip (taking all pedals not in use out of the signal path), the signal loss caused by my DanEcho became all too apparent. It wasn’t something I’d noticed much before (when the signal passed through it at all times), but since the true bypass loop took it completely out of the signal path when it wasn’t being used, its sonic impact became quite clear. It had to go. A few minutes on eBay later, I’d snagged a near-mint DL-5. 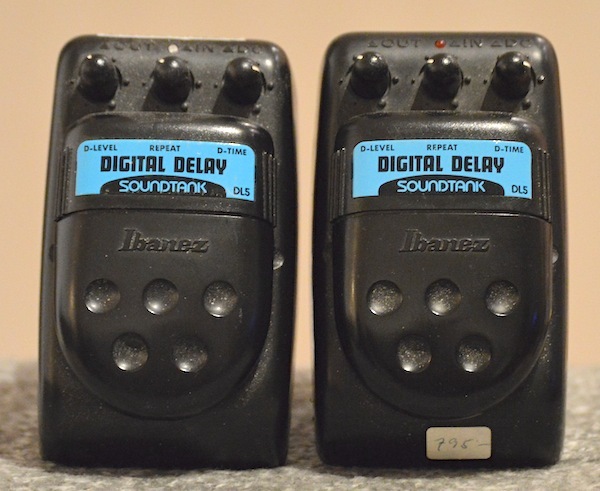 🙂 The Soundtank digital delay uses a digital delay chip which was designed for karaoke machines (you know that crappy karaoke echo – this is it!). Its original limit was 100ms, but Ibanez boosted it to produce 400ms with reasonable fidelity. It sounds very warm and musical – not analog as such, but more like a good Boss DD-2. I’ve also rolled off a little treble from the delay signal, to place it a little more underneath the dry signal. I later bought a second DL5, partly for use on an additional board and partly as a spare. 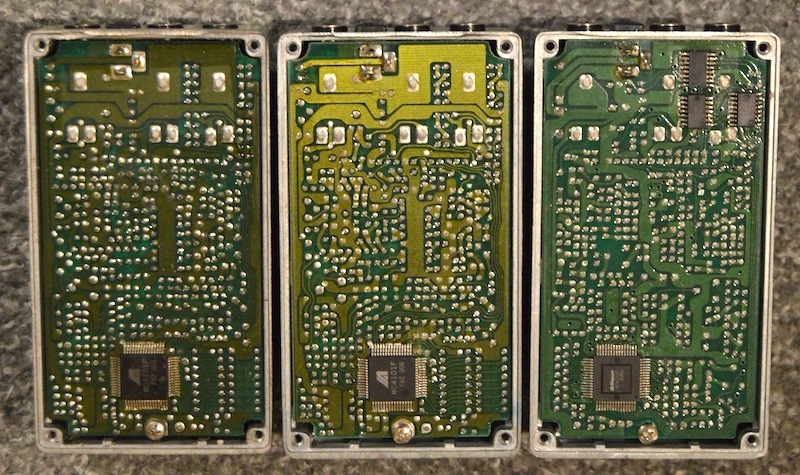 I wouldn’t recommend any of the Soundtank series pedals to heavy stompers or people who regularly plug in/unplug them – they are plastic and the jacks are supported only by the solder joints to the circuit board. 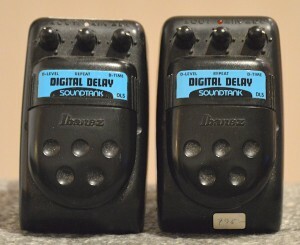 Relatively quickly, Ibanez’ catch phrase for the Soundtank series – ”Built to withstand the stomp of Godzilla” – proved to be a slight exaggeration 🙂 But if you keep it on a pedalboard, and especially if you use a loop strip (so you don’t even have to step on it to turn it on/off), it’ll work just fine. 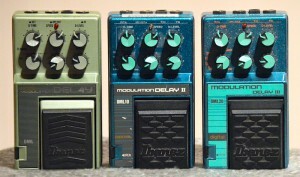 I later bought the DML20 (Digital Modulation Delay III) for use on a second board. It differs from the DML10 in that it has slightly longer max delay time (1024ms instead of 900ms), a more clearly marked mode selector (with labels for ”chorus”, ”flanger” etc) and slightly brighter repeats. 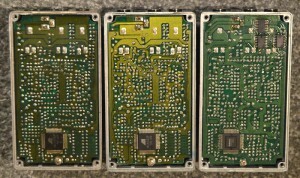 It uses a different delay chip than the earlier models, and has had a few other changes too (the picture to the right shows the back of the main circuit board of the DML, DML10 and DML20, in that order). But even so, it sounds nearly the same. The repeats are just a tad brighter. 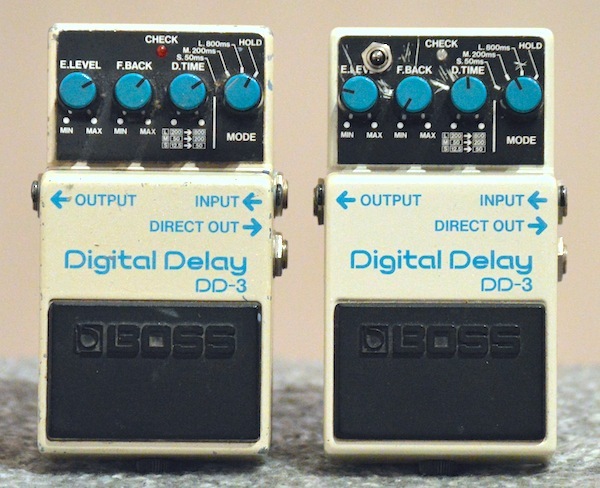 It’s the same old story, it seems – with every update made during the early days of digital effects, the pedals got more clean/clear (it’s the same with the Boss DD-2/3). I guess it was the preferred direction at the time, but these days, I tend to prefer the older, more grimy-sounding ones. Then the DML (Digital Modulation Delay) arrived at my door, and it seems to support the theory – this was the first in the series, and it does indeed sound a little smoother and less bright. 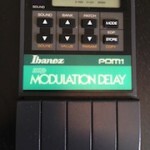 It is limited to 512ms delay time, but uses the same delay chip and is otherwise very similar to the DML10. And after a slight treble cut on the delay signal, it sounds wonderful! Oh, and if anyone has a PDM-1 (the modulation delay from the programmable DCP series) gathering dust, I’m interested – obviously, it was the next step in the series, and I’m curious to see how it holds up (and if the ”new and improved = brighter/clearer” theory holds up). So if you have one you’re willing to let go, shoot me an e-mail at andreas(at)stinkfoot.se! The Soundtank series was originally introduced in 1989, as a replacement for the ”10” series, and featured a sturdy metal housing. 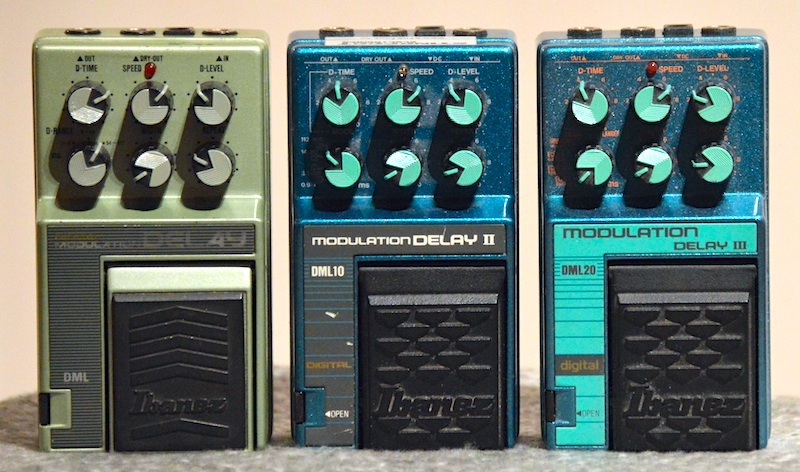 Sometime in the early ’90s the line was expanded, and at the same time redesigned with plastic housings, which wasn’t exactly Ibanez’s brightest moment. At least not from a reliability standpoint. Still, many of these pedals seem to have survived years of abuse, so what do I know? But I prefer to be a little careful when handling them – the pots are mounted directly to the circuit board, with plastic axles that protrude through the pedal’s shell – which means that they will snap off in a heartbeat if you bump the pedal the wrong way. Still, there are some gems to be found in this series too. The EM5 was introduced in the summer of 1997, which was rather late in this series’ life – the bugs were finally dropped in 1999. It is a digital delay, designed to mimic the sound of a tube tape echo. Many have tried their hand at that before, but this is the only delay/echo pedal I know of that actually has a distortion circuit built into the delay circuit, to mimic the distortion generated inside an Echoplex. Does it work? The answer is – as usual – both yes and no. The pedal does sound much more ”alive” than a regular digital delay, and there is a faint break-up in the signal which somewhat reminds me of an Echoplex. The EM5 is a great rockabilly/bathroom/slap-back type echo, and it also does an awesome background drone effect. 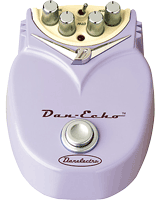 With the feedback knob on (or very close to) max, this particular pedal will keep echoing everything you play indefinitely (adding layer after layer of sounds into the mix, which will get more and more garbled and distorted with each repeat), but it will never run away from you – it does not take off into uncontrolled self-oscillation. It’s an awesome sound, especially with the baritone guitar, which creates a very eery background texture to some of the more Daniel Lanois-influenced stuff I play. 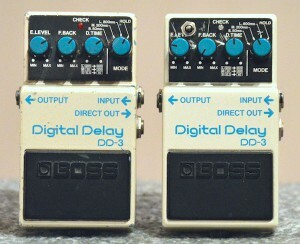 Both are the first version of the DD-3, which was the same as the DD-2, except for the name (obviously) and the dry output, which in the DD-2 was a parallel delay output. One is broken and in bits – one of those never-ending ”I’ll fix it when I get the time” projects – while the other is working fine and has been modified with a three-way treble cut switch. I planned on using it on my big/main board, but the Boss does something to the dry sound which I’m not too happy about. I’m guessing it’s the compander/expander circuit that makes its presence a little too known for my taste. Most people probably don’t notice this, as they run the signal through the pedal at all times (turning the delay on/off from the pedal itself). On that board I used a true bypass loop strip to turn my delays on/off independently, and the difference was quite apparent. Eventually, the DL5 won out – it just seemed to suit my playing style a litte better, and didn’t change my dry tone either. Again, it’s probably not something most people would even notice, but it bugged me a little too much.